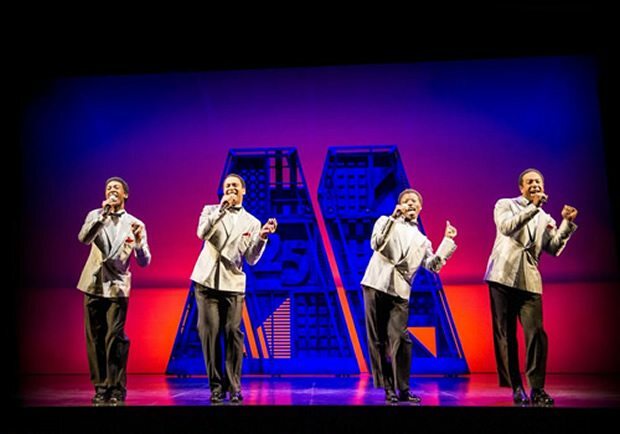 Even with a list of supporting characters including the likes of Gladys Knight, Michael Jackson, Stevie Wonder and Jackie Wilson, there’s no mistaking that the star of Motown the Musical is Berry Gordy, not least because he wrote the book to the show. As the founder of the Motown record label, Gordy spearheaded a truly spectacular musical movement in the city of Detroit, launching the extensive careers of Diana Ross, Smokey Robinson, Marvin Gaye, and The Jackson 5. With such a back catalogue of hits at his disposal, what other than a jukebox musical to celebrate the story? The vast choice of songs is almost overwhelming, but the decision to fit in as many as possible (over 50) doesn’t always pay off. We get many abbreviated versions, performed in recording studios and TV performances; others are awkwardly wrestled into the narrative as Gordy’s relationships with his artists, particularly the young Diana Ross, develop. Most challenging of all, new songs have been composed to give Gordy more of the limelight, here performed with ad-libbing fervour by Cedric Neal, but leaving no doubt as to where the spotlight is intended. Despite the elements of a vanity project that recasts the tale of this record label supremo from his humble beginnings without any of the difficult bits, director Charles Randolph-White manages to skilfully weave together something effective. The production line of acts (The Supremes, The Temptations, The Marvelettes, The Miracles) and their numerous hit singles take precedence over the light touch on the racial politics of the era and in a rare moment of a song being allowed to play in full, the exuberance of Martha and the Vandella’s ‘Dancing in the Street’ takes over the whole company in glorious style with Patricia Wilcox’s choreography. Likewise, the Act 1 finale is a blistering piece of musical theatre: as Martin Luther King, Jr.’s murder leads to rioting in Detroit, the fierce anger of protest song ‘War’ gives way to the searching questioning of ‘What’s Going On?’ Sifiso Mazibuka’s Gaye delivers a fantastic performance from the front. Does it then matter that Gordy has tinkered with the timeline? That riot was in 1967, a year before King’s assassination and those songs came out in 1970 and 1971 respectively, responding to different events. Such creative license with the book also extends to the personal beyond the political, Gordy unabashedly airbrushing as he goes, framing the story around a 25th anniversary reunion concert for Motown, which conveniently avoids him having to deal with his sale of the company 5 years later. “You built a legacy of love” says Charl David’s awestruck Smokey Robinson (otherwise excellent), “I’m the luckiest girl in the world” purrs Lucy St Louis‘s about-to-be-seduced Diana Ross. But again, the irrepressible force of Randolph-Wright’s production comes to the fore. The darker side to Ross’ ego-driven personality may not be in evidence, but we get a brilliant example of her showmanship in full force, as a cracking sequence sees her unexpectedly capture the audience effortlessly in her hand. St Louis absolutely nails the diva in all her breathy wonder. Even if it is the gloss rather than the grit that emerges as the driving force behind this version of Motown, is that really so bad in the end? Once you get used to the breakneck pace and the fragments of songs coming your way, Gareth Weedon’s high-powered musical direction ensures a great sound and the power of this music is impossible to resist. It just deserves a much better, balanced telling of its story than it receives here.